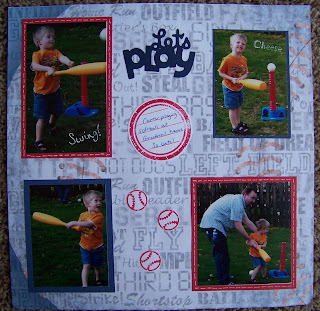 The Savvy Stamper: Play Ball! Well, I promised I'd be back with some scrap pages, so here's one to share! My poor son has inherited both his father's and my athletic abilities, but he sure has fun trying! Thanks for looking and happy stamping! What an adorable page and a little cutie pie! I am a stay at home mom with two beautiful little boys and a precious little girl. I like just about anything crafty - but mostly I like to scrapbook, stamp, cook, and read.